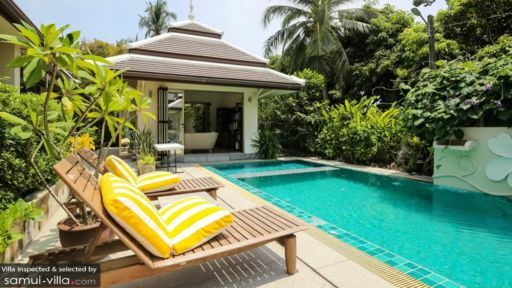 Sink into the slow, relaxed pace of life of south Samui during your stay at Villa Roucin. It’s at 100m from the sea, and a variety of restaurants are easily within reach. Containing four finely appointed bedrooms, the villa is perfect for travelling parties of eight. As with all luxury properties, Villa Roucin offers impeccable service, ultimate privacy and a full range of modern amenities. Four bedrooms - made up of two VIP suites and two deluxe bedrooms - are spread out across the compound. Each is carefully furnished, and features a unique style of its own. Both deluxe bedrooms offer wheelchair-friendly bathrooms, with drop down grips, large mirrors, toilet paper holder, towel rack and hand shower set within easy reach, washbasins designed for wheelchair users and an entrance that allows for a front transfer. There is a fifth bedroom with a single bed. It is perfect for one adult or as room maid. 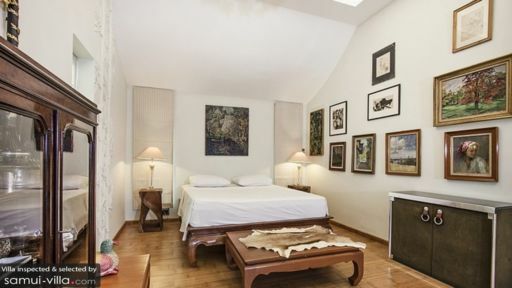 So the entire villa can easily accommodate 9 guests, plus additional 2-3 beds if necessary. Lush, leafy foliage frames the outdoor compound to create a sense of privacy. The space comes complete with a rectangular swimming pool, poolside sala and jacuzzi, as well as sun recliners outfitted with yellow-and-white pillows. You’ll feel right at home in the beautifully appointed living spaces of Villa Roucin. The well-equipped kitchen is bathed in natural light thanks to the glass-panel ceiling, and features a wide-ranging variety of cooking appliances - including barbecue facilities. Meals are enjoyed in a capacious dining area furnished with a wooden dining set flanked by dining chairs on one end and a bench on the other. The seats are made comfortable with cushions, and the space is enlivened with artworks and shelves filled with books and CDs. Push back the bi-folding doors to keep the lounge bright and breezy as an indoor-outdoor living space. 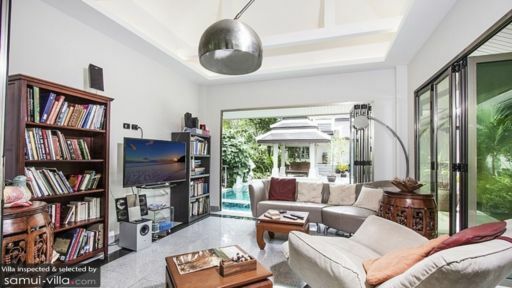 Couches and coffee tables are spread out across the room, and an LCD TV and two bookshelves offer entertainment, as does the billiard table located outdoors. Expect attentive service from a team of amiable staff at Villa Roucin, with cleaning service available twice weekly. Your villa manager will readily assist with airport transfers, bicycle rentals and car and motorbike hire. Massage therapists, along with babysitting and private dining services are available at additional cost. Guests enjoy free usage of barbecue facilities and a baby cot. Quiet Bang Kao is ideal for guests seeking a getaway from the tourist-populated regions of Samui. It’s at 100m from the sea, a coast that remains largely undeveloped, with a smattering of local shops and restaurants scattered in between. A favourite dining spot for beach-goers is Bang Kao Seafood. There are a handful of options for dining out nearby. Sweet Sister’s Cafe, located a stone’s throw away is a great bed for healthy organic fare. There’s also Fishing Cafe Samui, Auy’s Bar and Restaurant and La Bonne Cuisine. Pop by Magic Alambic Rum Distillery for locally made rums and rum syrups. Sightseeing attractions located around the vicinity include Laem Sor Pagoda (seven minutes by car), Hin Ta and Hin Ya Rocks (18 minutes by car) and Wat Lamai Folklore Museum (17 minutes by car). Culture buffs will enjoy taking in the majestic sight of the Big Buddha, located an hour’s drive away. Chaweng Beach, with its numerous dining and nightlife venues offers a lively ambience for villa travellers seeking a vibrant party scene. It’s 42 minutes’ drive from your villa.